I felt like I was drowning at the time. I had five children ages 7 and under, no one had yet reached that magical age of eight. So I trusted this wise mother of 9 knew what she was talking about and continued on with the hard work of making sure that my children were daily learning and practicing their chores. By the time my oldest did finally turn eight, I noticed that he really was contributing more than he was taking away. That sounds like a strange way to phrase it, but do you understand what I mean? The younger a child is, the more he requires from Mom or Dad. He needs help brushing teeth, tying shoes, getting his pants buttoned and zipped, getting buckled into the van, he needs his food cut, can’t pour his own drink, etc. etc. But there’s something about the age of 8. Not only can they take care of ALL of the above, but they can do so much more, and they can even start doing for others. For example, one of the chores that I delegate out to one of my “over 8” crowd is pouring drinks for everyone for all meals. – My oldest son gets out all of the plates or bowls and sets them in the designated area (we serve buffet style, so the plates don’t go on the table before meals), he also gets the two youngest in their high chairs. – My 13 year old pours all drinks and gets them on the table. – My 11 year old gets all of the silverware and napkins on the table. – My 9 year old gets out all condiments and salad fixings. – My 8 year old is my “runner”. She helps me with any last minute cooking tasks that I am finishing up, makes sure everyone knows to gather for dinner/wash hands, and puts the younger children’s food on the table for me after it has been cut up. So you see, where I used to do ALL of those jobs by myself for every meal, now I am only completing a portion of the tasks and overseeing the rest. Instead of Mom doing ALL the work for everyone, it turns into a very effective and efficient group effort when you get your kids helping around the house. The key is, you have to start instilling the work effort, and start teaching your children that they are part of a team, and then also teach them the practical skills for getting the various jobs done. Will it take more work? Yes, definitely. Will the job be done perfectly? No, not generally. But practice will hone those skills over time. Let me show you how different tasks are broken up in our home to give you an idea of the work split and also the ages at which we start different children working on different chores. This should give you a good idea of how to get your kids helping around the house. The 1 and 2 year old are required to pick up their toys, put their shoes away, and put their clothes in the hamper. My four year old is in charge of emptying the different bathroom trashcans, as well as the diaper trashcan into one of our two main trashcans each day. I don’t currently have a five year old, but I start my five year olds on wiping off the table after each meal with a damp cloth. My six year old is currently in charge of either wiping off the table after each meal, or sweeping the floor under and around the dining table after each meal (he alternates with his sister). He also organizes the shoes and keeps the mudroom tidy, pitches in with all of our many clean-up times throughout the day, puts his laundry away daily, and is able to change his own sheets each week. My eight year old daughter alternates with her brother with sweeping and wiping off the table, unloads the dishwasher in the morning, sweeps the kitchen in the afternoon, keeps her room tidy, and all of the other things on the six year old’s list. My nine year old daughter unloads the dishwasher in the afternoon, wipes the kitchen counters in the afternoon, does the lunch dishes, and all of the other things on the six year old’s list. My eleven year old sets the table for each meal, does the dinner dishes, and does a quick cleaning of each bathroom daily (this includes wiping the counter, wiping down the toilet, and swishing it with the toilet bowl brush and a little bit of cleaner Flylady style), he also does everything on the 6 year old’s list, he also helps me keep the laundry running when I need an extra hand. My 13 year old does the breakfast dishes daily, gets drinks for all meals on the table, is responsible for mopping the floors once a week, pitches in with all of our many clean-up times throughout the day, puts his laundry away daily, and changes his sheets each week. He also helps me keep the laundry running when I need it. My fifteen year old has graduated from dish duty, but if one of the primary dishwashers is sick, he is the sub. He is responsible for vacuuming the upstairs once a week, along with the stairs, he cleans the 2 tub/showers that we have once a month, he does the dusting, and he cleans out and vacuums the van once a week. He also pitches in with all of our many clean-up times throughout the day, puts his laundry away daily, and changes his sheets each week. The older three boys also help with lawn care and the oldest five all contribute in some way to pet care. There are probably plenty of jobs that I am skipping over, but the point here is…we work together as a team. No one person is responsible for getting everything done. So far, this has created an attitude of togetherness and purpose. We all count on each other. If you haven’t been requiring your children to do many chores, start slow, but definitely get started. I have found that there are so many chores around mealtime, so it is the perfect place to get started! Pick one chore per child, get everyone trained in the basics, and uphold the standard (if they don’t do it properly, teach them again). Once everyone is used to the first chores, add another, and so on. Before you know it, your stress levels and home cleanliness will be entirely different because you got your kids helping around the house. Do you have chores in your home? What does your system currently look like? 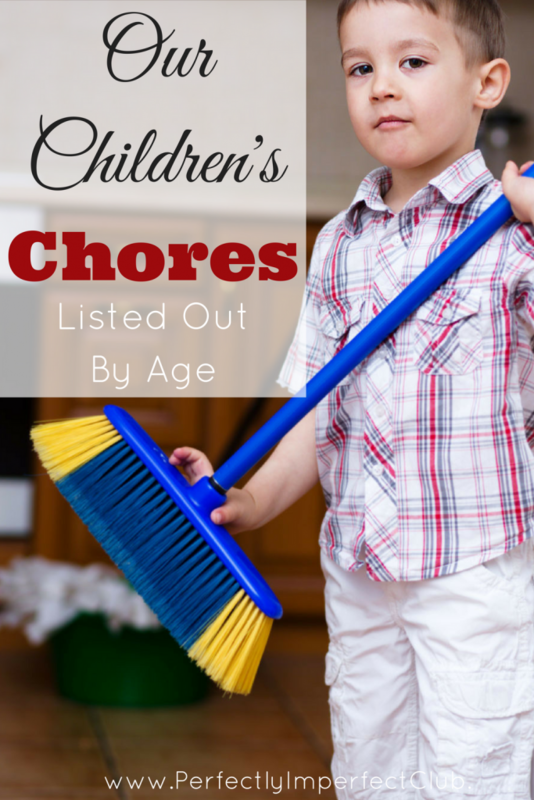 Here’s another post that I wrote up on our children’s chores if you want more information. I know exactly what you mean when you say giving more than taking from the family. I always refer to my kids as my allies once they turn 10. I’m a mom of 7, the oldest being 20 and the youngest is 4. 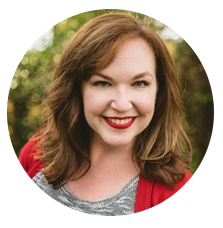 I pretty much have the “helper” thing figured out, but this is a great article for moms just beginning this stage.